Notes: I loved Yantarik's idea (Rav link) of making the cowl detachable, so I did that too. I made my cowl a bit smaller--only up to row 42. After that row, I did the decrease row and bound off. I found that my cowl stayed in place when I wore it, and so I decided not to add any sort of attachments. If things start to slip around later, I’ll put some small buttons on the cowl. With yarn at this gauge, if I use a small enough button, I can button right through the neckline of the sweater without needing any buttonholes. For the neck, I cast on 88 sts for size XS. This was 2 more than the original pattern calls for, but I needed a multiple of 4 to make 2x2 ribbing. Although I didn’t think to do it originally, I went back and made the ribbing using 2 needle sizes smaller, to prevent it from flaring out. After 3 rounds of 2x2 ribbing, I continued with the directions for short-row shaping except that 26 stitches were knit on the first short row, and the first set of 2 increases were ignored. This got me back to the right number of stitches. Unless I missed it, there weren’t any instructions for working the short-row wraps with their stitches, but I did it anyway. 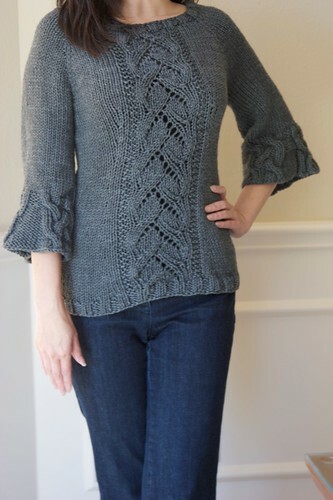 Like in the other Sweaterbabe pattern I made, this one calls for the sleeves to be made before the body. 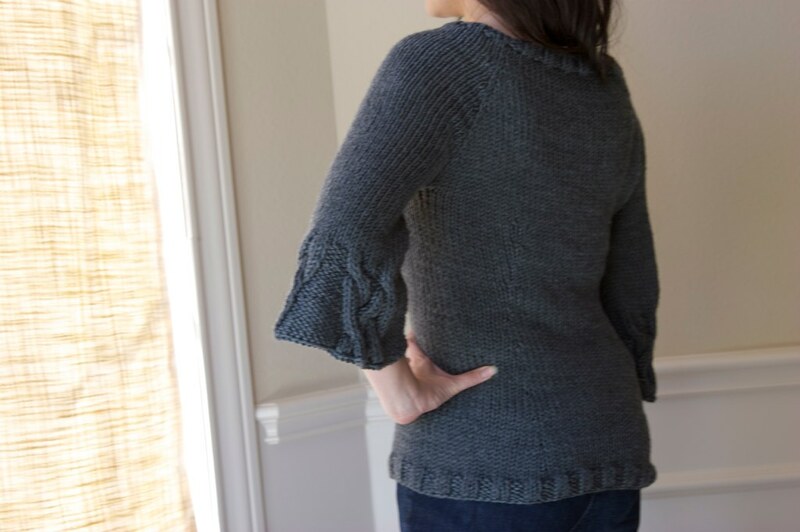 I always think it’s a better idea to make the body first, though, since the shaping there is more critical and since having a completed body allows you to try it on and figure out how you want the sleeves. The pattern uses the abbreviation “p-inc,” which is not defined as far as I could tell. I assumed this was a PFB, which was defined, so that’s what I did, and it looks fine. 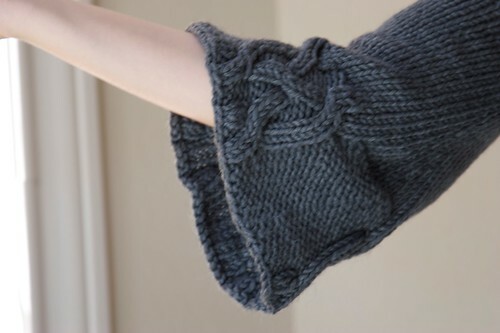 On the sleeves, I cast off in knit, rather than in pattern. This helped to counteract the slight tendency of the reverse stockinette portions of the sleeve to curl in. I decide to omit the belt since I didn't feel like it needed one. The yarn was a bit splitty, but not unreasonably so. 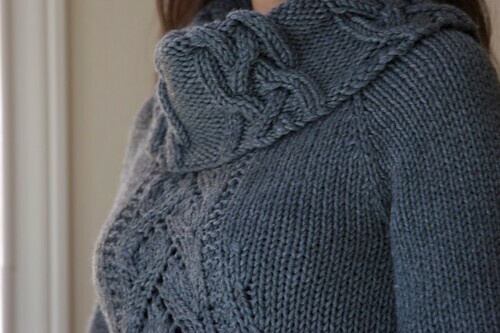 I really like it and think it’s a great alternative if you want the bulky yarn look but don’t want a garment that’s going to be too warm. 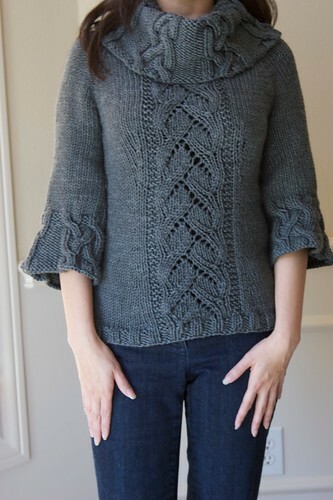 I love the detachable cowl neck! What a great added feature. 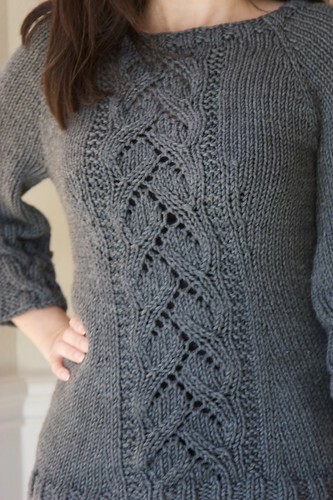 I hesitated to add this pattern to my queue until I saw your version. Thanks for sharing.